Snow Globe and I are not strangers. We have met before, just not under great circumstances. 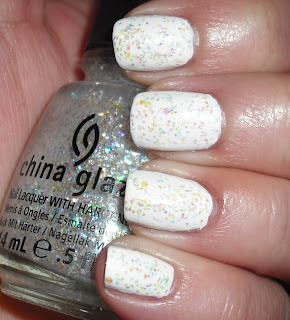 I purchased Snow Globe when it was first released in Fall 2009 with the other China Glaze specialty glitters. I instantly feel in love with Snow Globe. One day, after a few months of not using Snow Globe, I went to go use it to find it in a horrible state. Poor Snow Globe was completely hardened to the bottom of the bottle. It was not salvageable. No amount of thinner could restore this beauty. I got Snow Globe again with some of the other China Glaze holiday polishes, but I'm a bit hesitant that this one will meet the same fate. Snow Globe is a mix of large and small white iridescent glitter. I love the mix of colors you get in this glitter. It is very fairy, unicorn, Care Bear, My Little Pony, and Barbie-esque glitter. I'm sure do not not to further explain this. I hope you know what I mean. The formula in this is a goopysaurus. I instantly put a few drops of in thinner in this. One, to thin it out. Two, because I fear it will meet the same fate as my previous Snow Globe. Overall, this is definitely a pretty glitter. It just might need some extra care. I compared my old Snow Globe with the current one released and they look different to me. I tried it on my nails too. :/ The glitters looks different or at least the amount of it is. Such a pretty shade though. WOW! Gorgeous over the black! Wow, I've never heard of that happening to ANY polish before. I was under the impression that any nail polish was salvageable with enough thinner and shaking. I really hope this one holds out better because I was planning on buying it very soon. Let us know how it goes! I love how it looks when you wear it over black! I just bought this polish, but haven't had a chance to wear it yet. That is sooo pretty over black. Beautiful! I have to agree with the commenters, it looks so gorgeous over the black! Hopefully the formula is better this time around. goopysaurus - my snowglobe too. I guess it is just thay way it is. 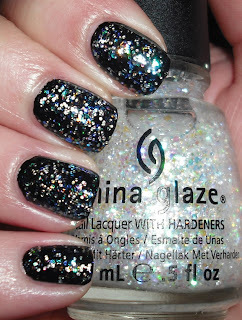 This looks so beautiful and magical over the black polish! I've had some troubles with my other glitters in this collection too, I keep a close eye on them! They do have a tendency to ... reduce themselves. *sigh* I once tried to build this up on its own, but no luck haha! It's gorgeous layered like you've done here though. Glad I'm not the only one who had this issue. They're finicky little polishes! I hope you get to wear it soon! This was completely hardened to the bottom. It was solid and cracked. There was no coming back from that. This has only happened to really glittery polishes like that for me, and it's rare even then. It could be just a dud bottle...it may have to do with temperature...I have no idea...it just happened! Wow! That's so crazy that yours was hardened like that. I love the iridescent glitter over white! ohhhhh, this is so neat! I think it looks awesome over white! Ahhh, it's so pretty. Over white, omg that is such a lovely look! Thank you for the tip - I'm going to keep a close eye on my bottle of Snow Globe!